Bibiana Spicy Hot Chocolate. Photo credit - Jessica van Dop DeJesus -&nbsp;www.diningtraveler.com. Guests at the Washington, D.C. restaurant have a reason to come back day after day in December. There are 8 nights of Hanukkah. And if you listen to that song about lords-a-leaping and partridges in a pear tree, there are 12 days of Christmas. Not so at Bibiana Osteria-Enoteca, where for the past 4 years staff unveils a drink a day from November 30 until Christmas Eve. “The program acts as an advent countdown to Christmas and a new cocktail is added each day,” says beverage director Tim Hayes. 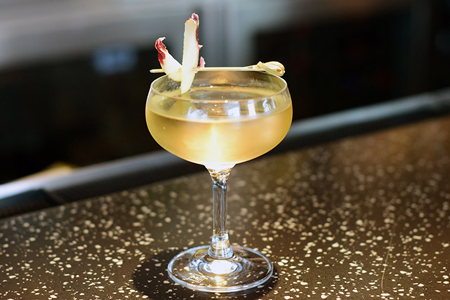 Drinks range from Old Fashioned riffs to bubbly elixirs to eggnog with a twist, as well as sips that incorporate Italian bitter digestivi, but all creations have a common thread. “The 25 Cocktails of Christmas is inspired by capturing fall and winter seasonal flavors with a wide spectrum of hot and cold liquors, amari, and spices using traditional and modern innovation,” adds Hayes. Among the most popular drinks (each is priced at $12) is the Spicy Hot Chocolate, with chili peppers, brandy and a cardamom house-made marshmallow; Vin Brule, a mulled wine with spices that’s served warm; and the Hot Buttered Rum, with rum, butter, brown sugar and cinnamon. 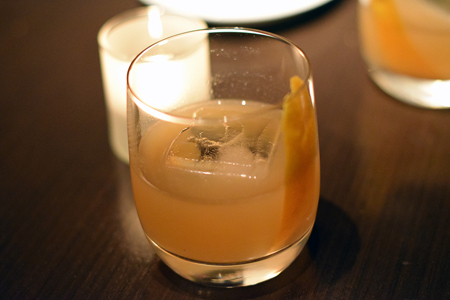 One of the most interesting (not to mention time-consuming) tipples is the Hazelnut Old Fashioned. “This is made by infusing roasted hazelnuts with Bourbon and spices for several days.” It is mixed in the traditional way, and the result has the aroma of hazelnut biscotti, and flavors that play nicely together—it could also serve as a non-sweet-but-still-satisfying end to dinner. 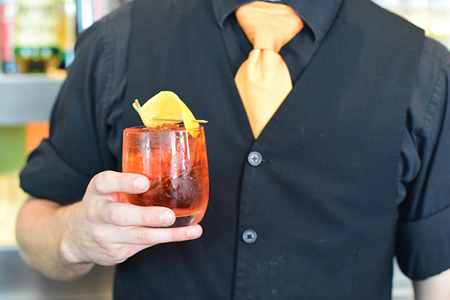 Negroni fans will find a fitting substitute in the Sbagliato. Its name means “mistake” or “messed up”, referring to the fact that the drink has Prosecco instead of the traditional gin. It’s festive and spirited, yet refreshing. And those who really like bitter booze will be drawn to the Amari Cup, with Averna and Fernet Branca along with cucumber, lemon, lime and gassoza (sparkling water). Hayes says there are guests that return regularly to Bibiana in December to see the cocktail-du-jour; this program truly is the Christmas gift that keeps on giving, the entire season through. Recipe courtesy of Bibiana, Washington, D.C. Whip the egg yolks, vanilla, and sugar together until they are thick and pale in color. Slowly stream in the booze while whisking, and then add the milk and cream the same way. Let this mixture “ripen” in the refrigerator for at least 2 hours, covered. Whip the egg whites until soft peak (meaning when you pull the whisk out the whites will form peaks that fall slightly). Before serving, fold the whites into the mixture. Top with some fresh grated nutmeg. Peel large sections of peel from the clementines, lemon and lime using a speed peeler. Put the sugar in a large saucepan over a medium heat, add the pieces of peel and squeeze in the clementine juice. Add the cloves, cinnamon stick, bay leaves and about 10 to 12 gratings of nutmeg. Throw in the halved vanilla pod and stir in just enough red wine to cover the sugar. Let this simmer until the sugar has completely dissolved into the red wine and then bring to the boil. Keep on a rolling boil for about 4 to 5 minutes, or until you've got a beautiful thick syrup. (It's important to do make a syrup base first because it needs to be quite hot, and if you do this with both bottles of wine in there you'll burn off the alcohol.) When the syrup is ready, turn the heat down to low and add the star anise and the rest of the wine. Gently heat the wine and after around 5 minutes, when it's warm and delicious, ladle it into glasses and serve.